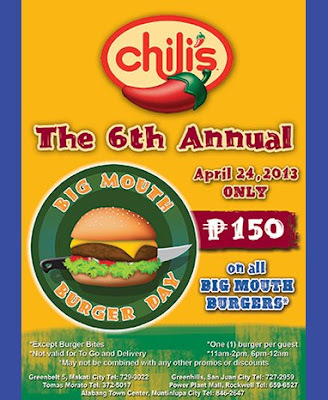 The Food Alphabet and More: Big Mouth Burger Day on April 24 at Chili's!!! Chili's most awaited event of the year is here once again to rock our worlds. Get the world famous Chili's Big Mouth burger for only P150.00. I have missed this event for 2 years straight already, well because the lines were just too long that we would have to wait for at least 2 1/2 hours to get our share, sad to say I had to get back to the office, but hopefully this year, my craving would be fulfilled. Catch it from 11am - 2pm and from 6pm - 12mn. Expect long lines, hungry faces and an aroma of beefy goodness, right from the doorstep. Of course as usual this is not valid to go and delivery. One (1) burger per guest. So bring the whole family along cause this will be a celebration like no other. See you at Chili's!